Private Internet Access is a highly popular service, and it’s not hard to see why. Both the quality and quantity of the server network are top class, with excellent speeds and competitive pricing as the main attractions. Private Internet Access (abbreviated PIA) excels in fast, reliable VPN-servers in countries where you need them most. For this reason alone it is no surprise Private Internet Access is very popular amongst VPN users who want to reach US Netflix or the UK’s BBC iPlayer from other territories. And are in need of some anonymous browsing. The total tally of servers may be smaller than that of other VPN providers. The ones on offer are without exception lethally quick, and hardly ever fail you. PIA’s 3034 servers in 28 important VPN countries mean it’s possible to find a solid server almost anywhere in the world. The USA and Europe unsurprisingly lead in numbers of servers. But you won’t have a problem connecting to one in Asia (with Japan especially well served) or Australia. The odd ones out are Africa, and Russia, although Private Internet Access is clearly catching up for African regions. 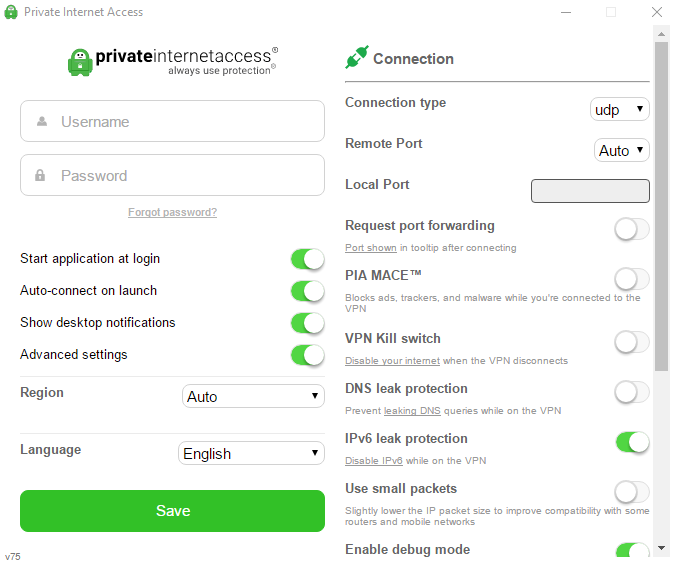 The various applications Private Internet Access offers are up to most of their tasks, mostly, but are not without issues. The spartan setup of the Windows app for instance makes switching servers a somewhat old fashioned experience. First you need to disconnect from a server, then select another one, then manually connect to that one . Steps that could use automation, if you ask us. PIA’s smartphone apps, like it’s VPN for Android, have better designs, and also give more information about the connections. After installing it’s a walk in the parc to binge Netflix without having to worry about your privacy. Or to use torrents or even play video games through this VPN service. As long as you pick the server that covers your needs. App interfaces for smartphones interact much better than the desktop version, and connect you to a solid VPN in a few taps. We also like the little dials that inform you of the quality of your connection in terms of up- and download speeds. Information that is strangely absent in the desktop apps. This strikes us as a bit off: while basic functionalities are roughly the same on both desktop and mobile apps. The latter’s interface design is much better. Most VPN providers offer special services to circumvent geoblocking. But Private Internet Access is not one of them. Of course it is possible to reach a streaming service like US Netflix or BBC iPlayer through a PIA VPN connection. But the blocking efforts of these streaming giants clearly take their toll. PIA users need to switch servers a lot to finally land on a server that is not hampered by geo blocking efforts. Private Internet Access’ country of establishment (the USA) may have something to do with it. New laws in the USA make it illegal to bypass geo blocks. Good news for streaming services. But PIA-users, especially non-Americans, may want to consider other providers if they want to keep binging series on US Netflix. Speeds in VPN services are largely dependent on the geographical location of the server. And on how they are connected to the wider internet. PIA really has this down to a T: their servers are without doubt among the most stable and fastest VPN servers around today. 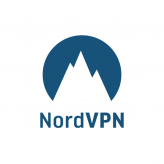 Never mind the sometimes dubious claims by other providers to this title… Especially servers based in the US and EU are lightning fast: it only takes seconds to connect to a VPN server, and you’re off, something we don’t often see when on other VPN’s. Of course Private Internet Access’ server parc is only as fast a the infrastructure surrounding it. 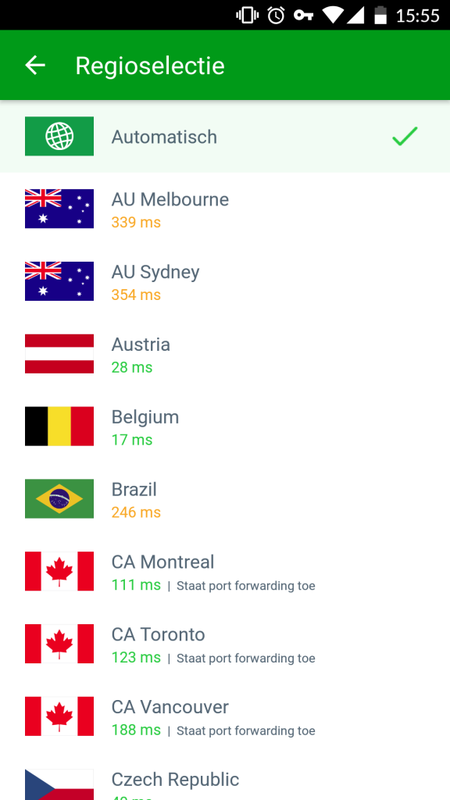 Connections in Asia and Australia are hampered by local conditions, impacting speeds independent of your use of VPN. Gaming in these territories, under these circumstances, is probably not a good idea. But when you get hold of one of the faster PIA servers, Bittorrent and streaming are no problem. Private Internet Access, like most providers, offers three subscription options. The least expensive one is a two-year subscription for 2.91 dollar per month. A year-long subscription is 3.33 per month, and there is a single month subscription for 6.95. With these kind of prices, PIA can compete with some of the largest providers of VPN services. Especially when you take the quality and speed of the service into account. To further increase its pull on new customers, we feel Private Internet Access could benefit from a free trial option, for a couple of days. The quality of the service speaks volumes, once you try it. Free VPN’s are available, but we don’t recommend using these. A reasonable yardstick for determining how a company deals with privacy issues, is its stance on (changing) laws. In our opinion, Private Internet Access takes this very seriously, considering the fact it stopped offering servers in Russia once the country changed its laws concerning internet privacy, compromising anonymity for those who seek it. Another yardstick is encryption. PIA users should feel relatively safe, although a recent form of protection in the shape of IKEv2 is conspicuously absent from the list of encryption protocols. Apps use OpenVPN as a standard, with the exception of iOS devices (something that can be fixed by using a seperate OpenVPN app, and filing your PIA details there). They do however offer the possibility of setting up your own DNS server, further shielding you from cyberattacks. Although Private Internet Access offers no specialised functions to stream Netflix from other territories than your own, like many other providers do, their service is still competitive. Most servers will do the work just fine. But, as we wrote before, it may sometimes need some switching between servers to find the right host for your browsing activities. Speeds are generally great, so binging US Netflix won’t pose much of a problem. A nice, thoughtful addition to PIA’s service is it allows Bittorrent and other Peer-2-Peer network activities on their servers – other companies restrict this to ‘just Bittorrent’, so this is a nice exception to the rule. Another nice perk is Private Internet Acces’ ad blocker, a default tool called MACE that’s built into the service. No matter which device you use when you go online, your internet will be advertisement free. Both things add to our appreciation of the service, for they genuinely improve the overall quality. Every PIA user, after installation of the apps, gets a randomly selected user name, one you won’t be able to change. This seems a bit clumsy at first, but you’ll start to appreciate the safety aspect of it. You won’t be recognizable to strangers. This username is used for correspondence with PIA’s staff, without giving away your real identity. Most customers’ service questions are answered through an online form; answering usually takes up a couple of hours. Notably absent is a service with a quicker response time: there’s no 24/7 chat service available, no phone hotlines, et cetera. PIA seems to be aware of the problem though. We understand the company is working on a customer service with shorter lead times. And saw mentions of online service staff that use social media like Reddit to cater to urgent needs of their clientele. Lastly, we’d like to mention the highly practical tutorials that help you setup your router to use PIA servers as default. With this kind of setup you make sure your internet traffic is encrypted at all times. It requires a bit of router tinkering, which some users may find too much hassle, but with the help of said tutorials you’ll manage. Private Internet Access is a highly popular service. And it’s not hard to see why. Both the quality and quantity of the server network are top class. With excellent speeds and competitive pricing as the main attractions. Using Bittorrent, or streaming Netflix or iPlayer content is easy, and online gaming is doable too. Although it won’t be without the occasional lag when you play against people on remote locations, considering the general quality of the internet. Still: when players in the US want to challenge EU or Asian players, or the other way around, PIA probably has the best VPN connection for you.